Just 45 minutes from Bali by boat, Nusa Penida has beautiful views, stunning landscapes, and one of the most gorgeous beaches we’ve ever seen. 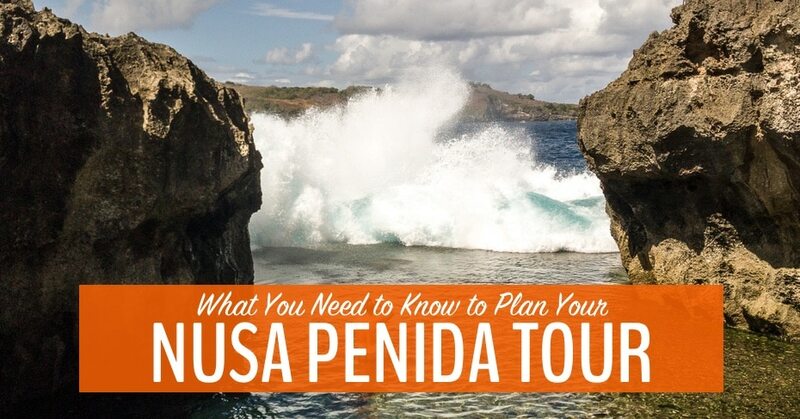 If you’re thinking about doing a Nusa Penida tour, this post covers everything you need to know before booking. What’s in our guide to a Nusa Penida tour? 2. Should you choose a West Nusa or East Nusa tour? 4. How much does a Nusa Penida tour cost? 5. What is included on a tour? 6. Should you do a Nusa Penida day tour from Bali? 7. What should you bring? If you know anything about Stephen and me, you’ll know that we hardly ever recommend tours. We prefer to travel independently, staying away from the tourist crowds and seeing things at our own pace. But the spectacularly beautiful Nusa Penida Island, not far from the south shores of Bali, is a tricky place to travel independently. For a start, there is little public transport available, and you can’t even hire an ojek (motorbike with driver) without a lot of hassle. Even taxis are hard to come by. Lots of tourists rent motorbikes when they get to Nusa Penida. If that’s your plan, read the section below about driving on the island before you do it! Get to Nusa Penida yourself, spend a few nights on the island, and book your tour while you’re there. Take a one day trip to Nusa Penida from Bali, squeezing everything into about 10 hours, depending on traffic. We did the first option, but the tour is basically the same either way. Here’s what you’ll see on your Nusa Penida tour. Watch the video and then use the post to plan your trip! Should you choose a West Nusa or East Nusa tour? The west side of the island is the more popular one — and rightly so. It takes you to visit four scenic spots, including the most perfect beach we’ve ever seen! If you want to go here, take a West Nusa Penida tour. Angel’s Billabong. A natural tidal pool, swimmable at low tide. Broken Beach. An inaccessible beach with an impressive stone archway. Kelingking Beach. The most beautiful beach on earth? Crystal Bay. A great beach for swimming and sunbathing. If you can’t stand crowds, you might want to opt for the east side of the island, where fewer tourists go. Atuh. A simply gorgeous Nusa Penida beach. Raja Lima. A viewpoint that’s perfect for Instagram. Gili Putri Cave. A Balinese Hindu cave temple. Teletubbies Hills. Green rolling hills named for their resemblance to the Teletubbies’ home. After a juddery hour on the road, driving in a long line of almost identical four-wheel-drive SUVs, we arrived at Angel’s Billabong. The parking lot was jammed. Was this tour going to be a terrible mistake? This parking lot was not a promising start to our tour of Nusa Penida! As we walked along the cement trail to the viewpoints, we weren’t feeling much better about our choice. Every space along the cliff held a girl in a bikini top striking adorable poses while her boyfriend took pictures. Actually, that’s not quite true. Only the Western girls were inappropriately dressed! Side note: Yes, I know I shouldn’t judge people based on their choice of clothing, but wearing next to nothing in a relatively conservative country is just not cool. Would it kill you to show some respect by throwing on a beach cover-up? We pushed our way through the crowds for our own photos and selfies and finally climbed down to the Billabong. Though the waves were crashing into the pool and churning back out to see, one guy ventured out near the edge. Angel’s Billabong is pretty but only safe for a swim when the waves are small. The crowd gasped as an especially large wave yanked him off his feet and threatened to drag him out to sea. He managed to regain his footing and retreated back to safety. Angel’s Billabong is only safe for a swim during low tide and when the waves are small. If your guide says to get out of the water, get out of the water. Once we were done at Angel’s Billabong, our guide, Madé, walked us a short way down the trail to Broken Beach. The actual beach, being at the bottom of a steep cliff, is inaccessible from the top. The only activity here is to admire the stone archway leading into the beach and take more photos for Instagram! If you walk across the archway, you’ll get the best view of the beach. When we were there, sadly, there was a dead dog washed up on shore. You get used to this kind of contrast when you travel in countries like Indonesia. Good and bad often come hand-in-hand, all becoming part of your travel experience. Broken Beach is a picturesque but certainly not a life-changing experience. At first, we thought that Kelingking Beach was just another pretty viewpoint, where we’d snap a few pictures and move onto the next thing. Then, we noticed that there were people down on the beach, hundreds of feet below where we stood. This is where our Nusa Penida tour took a turn towards the incredible. Kelingking Beach is best described with this picture. Kelingking as most people see it, from high above. It is a perfect stretch of golden sand in a perfectly protected bay. Looking down (way down!) at the beach from the cliffs above is a dizzying experience. When Madé, our tour guide, said “You can go down”, I didn’t believe it. How could we possibly get from here, way in the sky, to there, down at the sea? As it turns out, there is a trail, if it can be called that. It dips down off the plateau and onto the ridge that juts out into the sea. At the beginning, it is fairly steep and precarious, with low fences made of branches lining each side. This is the “easy” part of the trail, though the steep drops on either side did make me feel dizzy! The second half of the trail is steeper, in worse repair, more crowded, and even more terrifying. If you choose to go down, you’ll need nerves of steel and arms and legs to match. This is what the lower half of the Kelingking climb looks like. As we slowly scrambled our way down, sweaty tourists on their way up assured us it was worth it. Starting to feel breathless and dizzy from the extreme height, I wasn’t so sure. If Stephen hadn’t been there egging me on, I would have turned around after 5 minutes. Kelingking is the most beautiful beach we’ve ever sunk our toes into. Only a small percentage of the tourists up top ever make it down to the beach. The climb makes it feel all the more special — like you’re in a secret club of crazy brave people. Kelingking Beach after the epic climb – most tourists don’t (or can’t) make it down. After playing in the crashing waves for a while, we sat on the beach and absorbed the views. Though we loved the beach, I have to admit I was a bit worried that I wouldn’t be able to handle the climb back up! I resigned myself to being stranded for the rest of my life on the stunning beach. But, as the tide came in, leaving only a tiny bit of beach exposed, I realized I would have to leave with everyone else. My worry was all for nothing. Going up was much easier than coming down! Plus, the people in front of us were so slow that I had plenty of time to rest and catch my breath. After the sweaty, dusty climb out of Kelingking Beach, we considered skipping Crystal Bay and heading back early. But, we had visited there four years ago when we were on Nusa Penida and really wanted to see how much it had changed. Crystal Bay four years ago. Big tree stump, no people. Another 40-minute drive took us to the familiar beach. In 2014, there were only two small drink stalls and a small handful of people on the beach. Now, it is lined with little restaurants, beach chairs, and people soaking up the sun. By the time we arrived, many of the day trippers and boat trippers had already left, so it was busy but not overcrowded. Sinking into the crystal blue water and washing off the accumulated grit, sunscreen, and sweat from our day tour on Nusa Penida was the best feeling in the world. Crystal Bay made the perfect end to a tour that, if not perfect, was well worth the time and money. We were already on the island when we decided to do a tour of Nusa Penida. Before we booked, I emailed four of the main Nusa Penida tour companies for pricing and details. Two of them never replied and the two that did offered me the same tour at significantly different prices. This is typical in Indonesia, where pricing is often based on getting you to pay as much as possible, rather than offering the same price to everyone. Penida Tours was the most expensive at 1.35 million IDR (94 USD) per person. Discover Nusa Penida offered us the same tour at 1.5 million IDR (104 USD) for two people. Instead of going with either of these companies, we asked our hotel to arrange the tour. They use a local tour company called Sampalan Trans Company. Our Nusa Penida tour cost us 700K IDR (50 USD) for a car and driver for a full day. We arranged the tour at around 8pm the night before we wanted to go. What is included on a tour? Should you do a Nusa Penida day tour from Bali? If you’re going to do a day trip to Nusa Penida, you’ll have to book everything in Bali or before you leave home. 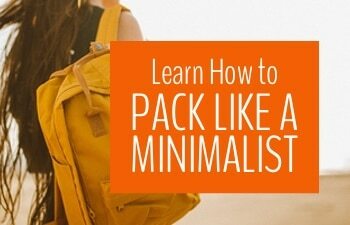 This greatly simplifies the trip, but will also cost you more. A Nusa Penida day trip from Bali is busy, but you’ll just be able to squeeze in all the Nusa Penida must sees! If you can handle the long day, a Nusa Penida day tour is totally do-able. Most of the Nusa Penida tour companies offer the exact same things, with varying prices. The only major difference can be in the quality of fast boat you get to take. It’s important to travel with a reliable company, since the fast boats can often be late or have mechanical problems — and the safety levels can also vary! Expect to pay around 100 USD per person for the full day with everything included. If you like to book ahead, this day tour from Bali includes everything I cover in this post and has excellent reviews. This tour costs a little less but it doesn’t have any reviews yet! You can also do a 2-day tour from Bali that includes Nusa Penida and Nusa Lembongan. This tour includes and overnight stay on Lembongan, plus snorkelling on both Nusa Lembongan and Nusa Penida. What should you bring on a Nusa Penida tour? 1. The roads are insanely lousy. Except for a few nicely paved stretches, the roads on Nusa Penida are indescribably bad. Roads that were originally meant for a few local villagers on motorbikes are now packed with scores of SUVs every day. In most places, the asphalt has worn away to infrequent chunks, which are connected by rocky, sandy, potholes. Even the good parts of road are narrow, winding, and crowded, making the driving hair-raising either way. It makes for a very bumpy ride. If you want to see the most impressive sights on Nusa Penida, you’ll have to get in line. 2. Avoid renting a motorbike on Nusa Penida. When you first get to Nusa Penida, you might be fooled by the perfectly paved beach road into thinking that driving a motorbike there will be easy. But inland, the roads transform into pot-holed messes, with sandy rocks, huge potholes, steep hills, and little or no asphalt. Unless you’re an excellent motorbike driver, I wouldn’t even try it. It might be all part of the adventure — or it could be a great way to earn a trip to the hospital. 3. Everything is farther than it looks on the map. Even though the sights look close together, don’t let that fool you. It takes about an hour to get between each stop. You’ll spend a good part of the day in the car, shaking and rattling your way from one destination to the next. If you’re prone to car sickness, take your nausea meds! Just because you’re on a tiny island doesn’t mean there aren’t traffic jams. We were stuck in this one for ten minutes. 4. Nusa Penida is not the deserted paradise it once was. If you’ve heard how secluded and tranquil Nusa Penida is, you’ll be in for a shock! The four destinations on the West Nusa Penida Tour are as crowded as the Mona Lisa on a holiday weekend. There are bikini-clad tourists everywhere, all jostling for that perfect Instagram shot. At least that is what it was like in early July. If you visit in low season, you might have a better experience. 5. The views will actually take your breath away. Despite these setbacks, we did come away from the day thinking “that was great!” We love observing and interating with people from all different cultures. The landscapes are incredible and Kelingking Beach is an experience we’ll never forget. 6. You should definitely stay a few nights on Nusa Penida. Unless you have time to stay for a few days on Nusa Penida, I would hesitate to recommend coming here at all. The great appeal of the island is the slow pace of life, away from the Aussie surfer dudes and ultra-spiritual yogis you find on Bali. 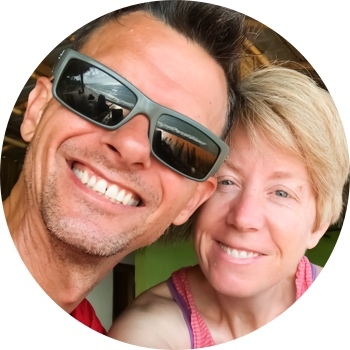 We loved the beautiful Namaste bungalows, which is where we stayed on our 2014 trip to Nusa Penida. It’s about halfway between the fast boat dock at Tojapakeh and Crystal Bay. Inside our bungalow at Namaste, Nusa Penida. Just down the road from Namaste is Bintang Bungalows, where our good friends just stayed. They said it was great! We also really enjoyed our villa at Petak Cottage on the north side of the island. It is walking distance to Penida Espresso, where they make delicious smoothie bowls. It also gave us an amazing view over Mount Agung as it was erupting! We can now cross “watch a volcano erupt” off our bucket list! 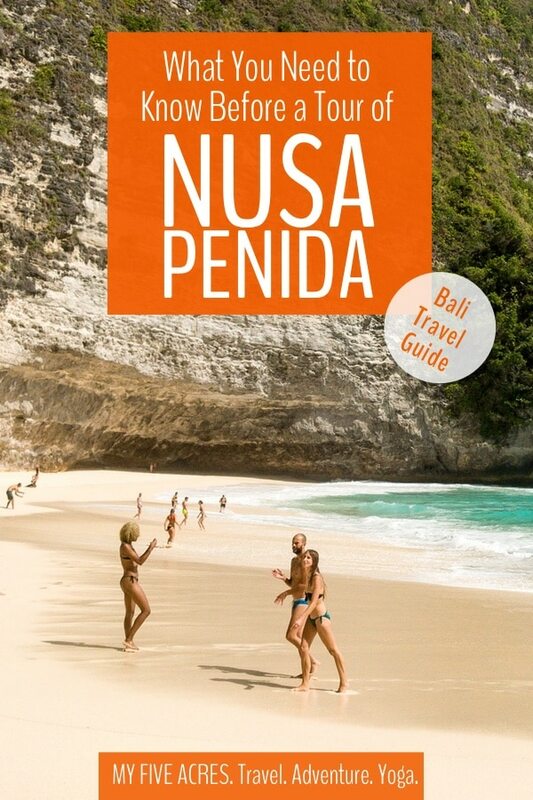 I hope this guide to taking a Nusa Penida tour is helpful when you’re planning your trip to Bali! If you have any questions or have been on Nusa Penida, please let us know what it was like in the comments below. Pin this for your Bali trip! Thanks for the info here! You mention that if we’re doing a day trip, we “have to” book everything in advance. Can we not show up at Sanur harbor at 7am, get tickets for the next boat out, and once we land would there not be many taxi drivers willing to drive us around for the day before catching the boat back that afternoon? Why do we “have to” book everything in advance for a day-tour? I suppose I will if absolutely necessary, but do we need to? No, you’re right Noa, you don’t “have to”. You could do as you suggest but I’m certain it will be a bigger hassle and am almost certain it will cost you more. The cheapest and most efficient way will likely be to book through your hotel on Bali – you could even do this the night before if you’re not sure when you want to go. They will arrange the boat tickets and a driver on the other side. For people who show up at Sanur and try to buy boat tickets there, they usually end up paying twice as much as those who arrange the boat ticket before. Also, if you arrive on Nusa Penida with no tour booked, the touts there will be able to name their price because, unless you rent a motorbike, that’s the only way to see the sights. Let us know what you decide to do! I’d be interested to hear how it goes if you decide to put your bargaining skills to the test and just wing it on the day! 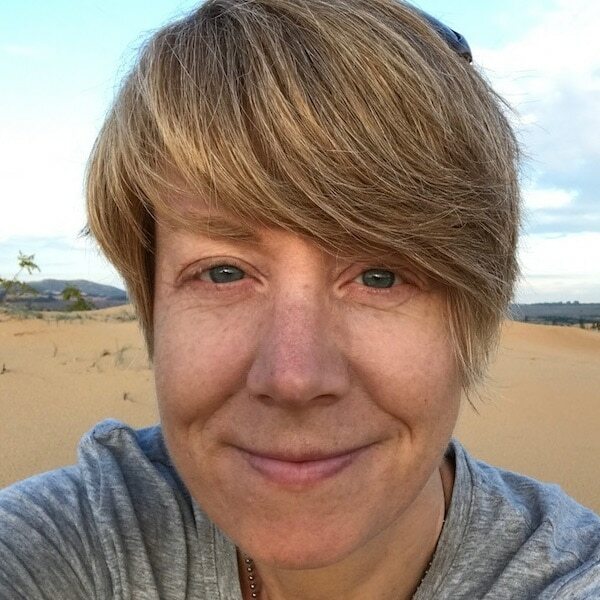 Pingback: 6 Places I Can't Wait To Visit In Indonesia & Win A Trip! Pingback: Your Guide to the Best Ubud Vegan & Vegetarian Restaurants | My Five Acres. Travel. Adventure. Yoga. Oh my God! Is it heaven on earth? the white sandy beach, the scenery are both absolutely fabulous! I am attracted to Broken Beach, so nice! I’ll should get the flight ticket right away!! Pingback: Is This Cosy Retreat the Best Place to Stay in Lombok? | My Five Acres. Travel. Adventure. Yoga. Pingback: The Best 7 Things To Do in Gili Islands for Mindful Travellers | My Five Acres. Travel. Adventure. Yoga.